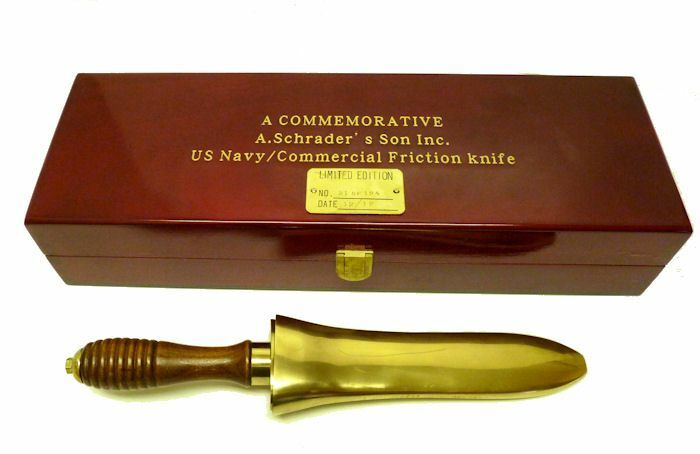 Presented is a newly issued flat sheath A. Schrader Navy dive knife that predated the MK V dive knifes that are still in service today. A. Schrader's & Sons, Inc., of Brooklyn, NY was one of the the first two makers of Navy MK V helmets and diving knives that came before them. The original flat sheath design were introduced in 1912 and were Navy standard issue as well as being used by commercial divers. 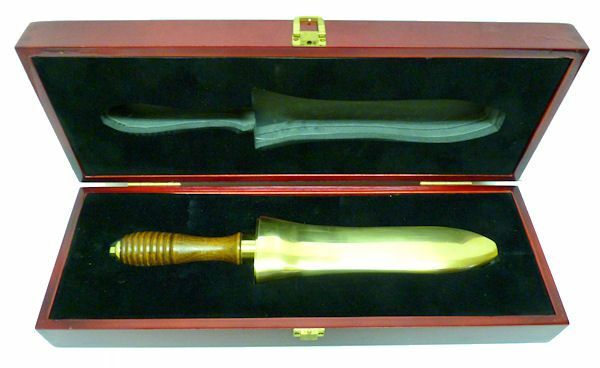 They saw service until 1929 when the Navy adopted the MK V Diving System knife. This knife was made to the same plans and quality as the original. It comes in a fitted high gloss Mahogany presentation box with gold lettering, and fitted grey foam liner. MARKINGS: The sheath is unmarked, and the blade is engraved A. Schrader's Son Inc. The knife is designed to slide into the sheath with a friction spring holding it in place. This allows it to be easily and quickly removed. The upper edge of the knife blade is flat while the lower edge has a very sharp knife edge. A rare A. Schrader dive knife for the collector or for use. CONDITION: This knife combines the skills of forging with those of metal working and, hand turning, and hand assembly so expect some minor imperfections as you would have found in the original. That said, everything is in "New in the box" condition. The blade has been honed to a sharp edge. The wood handle is finished in satin varnish. The case in high gloss. The sheaf is bright and comes with it's leather strap which is not pictured. International buyers welcome, but must inquire first. We have satisfied customers in Argentina, Australia, Austria, Belgium, Bermuda, British Virgin Islands, Canada, Chile, China, Czech Republic, Democratic Republic of Congo, Denmark, Estonia, England, France, Germany, Greece, Holland, Hong Kong, Hungary, Iceland, Indonesia, Ireland, Israel, Italy, Japan, Kuwait, Latvia, Luxembourg, Martinique, Mexico, New Zealand, Norway, Nigeria, Nova Scotia, Panama, Poland, Portugal, Puerto Rico, Romania, Russia, Saudi Arabia, Scotland, Singapore, Spain, Sweden, Switzerland, Thailand, Turkey, United Arab Emirates, USVI and the Eastern Caribbean.